The quality of granite is usually determined by a number of ways. It can also be quite confusing to determine the best quality of granite to choose. This is due to the fact that there is no universal grading standard. The quality is thus determined by those who manufacture it. The quality of granite may also depend on its location. 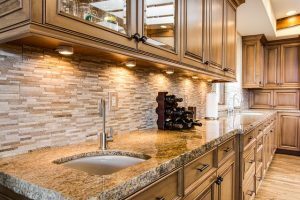 Granite should be available either in a rectangular or square size. The size can also reflect the user need. In addition to that, the slabs tolerance must be lower or equal to 1 mm. The tolerance of its thickness must also be lower or equal to 15 %. A standard color is a key. It should also have the same crystalline texture with average thickness. The granite slab compact, hard and complete. To check its firmness, you need to press the stone using a solid object. In case you notice some damages of stone, then the slap has a poor quality. When struck, the slab must produce a vibrant sound. It should also be clear with no round spot on its back. You also need to check on its refining quality. This translates to straight edges with one face well-polished. You also need to check it by rubbing its surface using a coin. This way you will determine its good quality. If it scratches, then the granite slab is of poor quality. Its sloping should also be flawless. The diagonal must be in uniform length. The granite’s top layer should have no cracks, cavities or any holes. The layers corner must be both square and sharp. When checking on its color, you need to rub it using a rag dipped in petrol. The slab should bring no color at all. In case of any, then it means it contains artificial traces. To check its porosity, you need to add a few drops of citric acid onto its surface. A high-quality slab will not absorb the citric acid quickly and vice versa. The citric acid will form white stains on its surface if calcite is present in high amount. This means the kitchen granite is of poor quality. So, do you now know how to check the quality of granite? There are many ways to determine the quality of granite. Some grades will appear better as compared to others. You need to use the above tips to find out if the granite you choose is of high or low quality. To approve the slabs, you need to check their quality in a laboratory.